On Friday , there was a piece of Russian space debris, about the size of a school bus, heading towards Calgary from space. Luckily, it changed course in the nick of time and averted a huge disaster. It ended up falling into the Atlantic Ocean. The junk’s flight from space happened so quickly that emergency officials scrambled to prepare a public warning that would have broken into regular radio and television broadcasts. Norad alerted officials in Ottawa, who in turn got in touch with emergency officials in Alberta. Shortly after 10 am on Friday, the Alberta Emergency Management Agency was told a piece of rocket debris the size of a school bus was hurtling toward southern Alberta. Initially, the trajectory was to take the rocket debris into Calgary, but officials soon changed their analysis and estimated the fall would be in Wheatland County, about 110 kilometres east of the city. Colin Lloyd, executive director of the Alberta Emergency Management Agency, said they set up an emergency command centre and alerted the premier. Officials scrambled to organize for the worst-case scenario. If the object had struck in a residential area, "it probably would have been significant loss of life," Lloyd said. Fortunately, a nightmare scenario was averted less than 40 minutes later when the debris was deflected off its course in the atmosphere and landed harmlessly in the Atlantic Ocean. But it was such a close call that AEMA was within seconds of issuing the public warning notice. Lloyd said a public warning notice was about to be sent out at 10:46 am. Among the messages was a warning for people not to get close to the object, as it could be radioactive. "As one of our staff was about to press the button to launch the message that would go out to members of the public alerting them of the event, we received notification from the government operations centre in Ottawa that in fact the debris had … sheared off in the atmosphere and was now actually in the Atlantic Ocean." So, if there was a warning issued, what could you do anyways? Hide in your bathtub!? 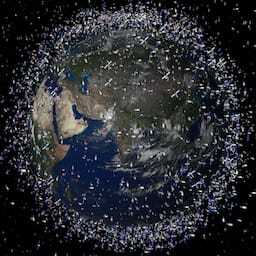 Maybe we should clean up our mess in space after all…? Calgary Dodges Space Junk was published on Saturday, February 14, 2009 at 3:34pm MST by Daniel Menjívar and last updated on April 11, 2018 at 9:30pm UTC .